Find free classified ads for Property services for sale and to buy in Liverpool. 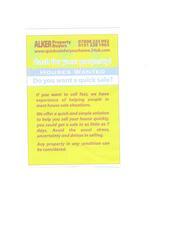 Shown below are classifieds for Property services. Please use search box above to find other items in Property services Liverpool or look at the Liverpool for neighboring places in the locality. Marshall Property Construction Ltd is a subsidiary of The Marshall Group Holdings Ltd a company with a 30-year track record of delivering property related services to clients throughout the UK. The Marshall group is a family owned organisation headquartered in Liverpool in the North West of England. Marshall Property Construction provides property and land owners with solutions to unlock the value in their assets. Wanted residential property any condition.Firm offer within 48 hours.No obligation on receiving an offer.Timescale to suit you and your situation.Any residential property considered.No fees payable by you. Contact Via simple online form www.quicksaleforyourhome.34uk.com 07808223992 0151 228 1963. United Kingdom free classified ads for Property services, Liverpool, Property services free ads Liverpool, Property services for sale Liverpool, Property services to buy in Liverpool. This page is a listing of classified ads for Property services category in Liverpool. This section includes classifieds for sale and to buy in Liverpool. Property services Liverpool ads Liverpool, Property services classifieds Liverpool, Property services free ads Liverpool, ads for sale Liverpool, ads to buy Liverpool, FREEADS in UK. Find here ads for sale, to buy and rent in Liverpool. Goods for sale in Liverpool, vehicles for sale in Liverpool, Liverpool real estate for sale, Liverpool property for sale, property for rent in Liverpool, business ads in Liverpool, Liverpool business classifieds, services in Liverpool, Liverpool services ads, jobs in Liverpool, pets for sale in Liverpool, Liverpool dating, Liverpool cars for sale.